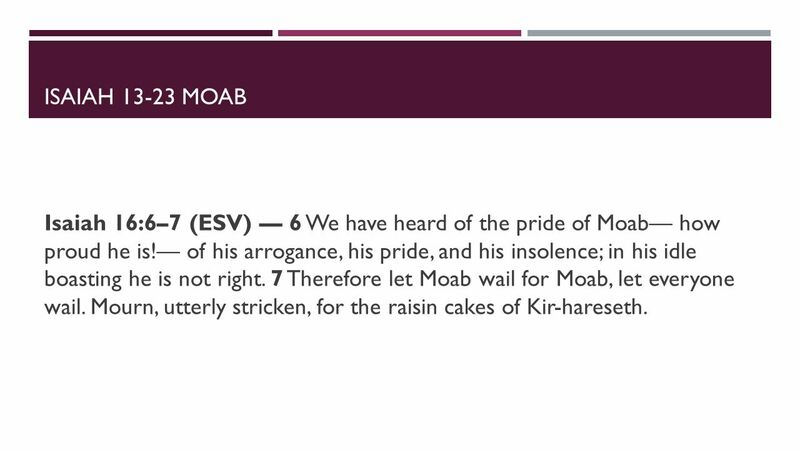 In these two final verses of Isaiah’s lament over Moab, God reveals that it will be three years from the time Isaiah made these warnings before Moab falls to Assyria. “As an hireling” is confirmation of the three year period. It was the custom for a hireling to have a three-year contract with his employer. At the end of three years, the hireling could choose to continue, or to leave. The number of survivors would be very small, merely a remnant; that remnant would be weak, unable to defend themselves, feeble and without hope. And that is exactly what happened. You can read the story in 2 Kings 17, in which Assyria takes the 10 northern tribes of Israel, along with Moab, into captivity. As Isaiah saw the bleak future that awaited Moab because of its pride and sin in turning to idol worship, he makes these verses, from 6-14, very personal. He sees what is coming, but has no power to stop it. He is grieved, and expresses his grief in heart-felt words. In his lamenting over the fall of Moab, Isaiah describes how even the agricultural fields have been torn apart by the enemy, and left desolate, with no one to cultivate the vines. Heshbon was the capital of Sihon. Sibmah is perhaps the same as Sumia, three miles west of Heshbon. It was customary, during the harvest and especially the harvest of grapes, for the people to rejoice with loud singing and shouts of joy for the bounty of the vines. That would not happen when Moab fell to Assyria. It would be quiet throughout the land, except for the weeping of the survivors. “No connection. Check cables, router,” etc. etc. etc. All I need to do is click on the wi-fi icon at the top of my page, and then click on my personal wi-fi network. Good to go, literally in a matter of seconds. Sometimes, though, I forget to do that. It’s usually a matter of just a few minutes before I realize I’m not connected, a few seconds more to rectify that situation. The difference in the computer situation is that I have to remember to flip on my PC before I can get wi-fi on my laptop. God is always up and running. Day or night, 24/7, He is available and ready to work. I was so thankful for that this morning. As I rolled to a sitting position, and my feet hit the floor, I felt that little tweak in my back that signaled trouble. I sat very still, praying for God to touch that place, and when I stood I did it with the support of my cane and my bedpost. Stood still for a minute, stretched a little bit, and found I was good to go. And that, my friends, is how an old lady with an old back has to do things sometimes. I’m thankful that my God is always connected. The only communication failure that happens between us is mine. Isaiah often combines his prophecies of the near future and then looks beyond that to the end times when all prophecy will be complete. Moab, in Isaiah’s time, will be defeated by Assyria, and will suffer complete destruction. I looked at several explanations for the versions that translate raisin cakes for the foundations of Kir-haraseth. There seems to be general agreement that the raisin cakes, a sweet delicacy, and perhaps also flagons of wine, were offered in sacrifice to the gods of the Moabites. It’s an obscure reference, though, and I’m not a student of the Hebrew language. I have to depend on commentaries. This does seem, though to be the generally agreed translation and meaning. 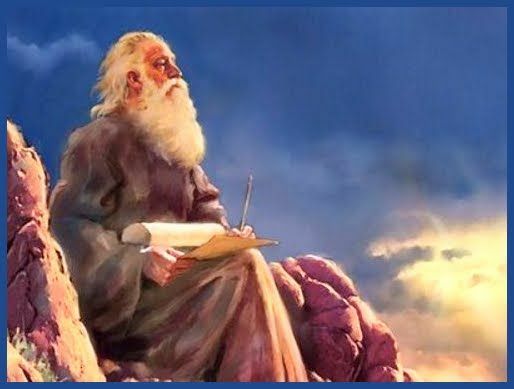 Moab has a unique place in history, because not only was Moab a place of refuge for the Jews in Isaiah’s day; it will also be a refuge for the remnant that escape from Antichrist, and will be sheltered in Petra, to become the nucleus of the race heading into the Millenial Kingdom. Petra is an amazing place, with temples and housing built right into the rock. There are no easy roads into Petra, which makes it highly defensible. I’d love to see it someday. the time of Jacob’s trouble.” At the end of the warfare of Har-Magedon, the King of the North will pass through Palestine, “the glorious land,” on his way to conquer Egypt. But Edom, Moab, and Ammon will “be delivered” (Dan. 11:41).Satan will have instigated Antichrist to lead the armies of the Roman power to exterminate the Jewish people, and particularly the godly remnant who have already turned to Jesus, Messiah. Those Jews will have escaped to the rocky, deep valleys and the mountains in Moab (Matt. 24:16). Moab is to guard them and nourish them there for 3 1/2 years (Rev. 12:14, with verse 6). Moab is to listen to godly counsel, and make godly judgments. They are to be the refuge for believing Jews, hiding them. To bewray is to make accusations, to speak unkindly about someone, to betray people. The believing Jews who survive in Petra of Moab will be the nucleus God uses to establish His kingdom in Jerusalem. The spoiler and the extortioner is Antichrist, who promised much but meant not a word he said. In 16:1, “the ruler of the land” is the occupant of the throne of Dave, to whom the tribute of lambs is to be paid by Moab, represented here by Sela, or Petra.This tribute had been sent to Samaria (2 Kings 3:4); now the lambs must be sent to Jerusalem and this will be the case, by way of Gentile tribute, when Christ comes to deliver Israel (15:5). The plea in verse 1 is for Moab to shelter the Jews who survive Antichrist, and to protect them and nourish them. 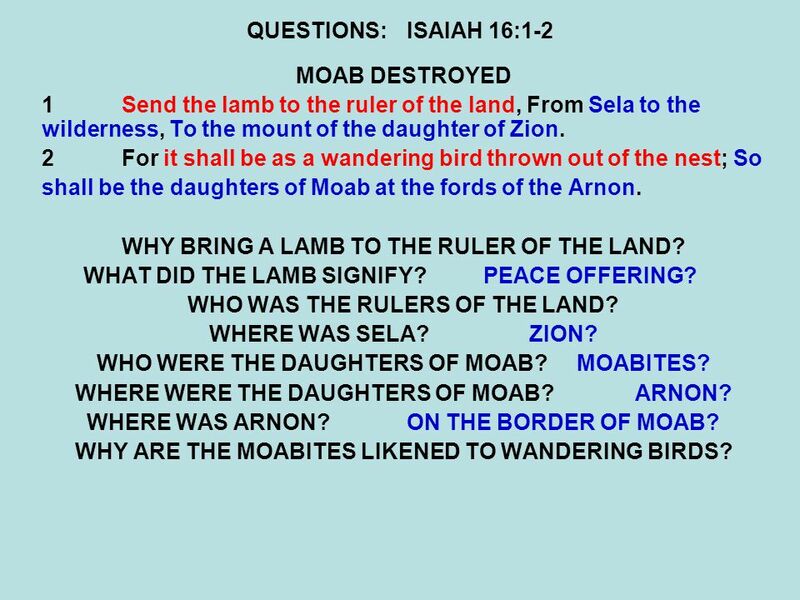 The Moabites are compared to wandering birds. A bird cast out of its nest will wander from place to place, seeking its home. This is the way the Moabites will react when Antichrist breaks his covenant with Israel, and the Jews are forced to flee or they will die. Moab becomes a place for them to hide, and to be taken care of. During this period, the last half of the Tribulation, Israel will become strong enough to take a last and victorious stand over Antichrist, who will have spent 3 1/2 years warring against those nations who rise up against him when they finally understand his true purpose.